Upper Perk & New Hope Physical Therapy & Sports Rehab is proud to serve the Upper Perkiomen Valley area through a variety of skilled physical therapy services. Our staff consists of highly trained Physical Therapists who have specialized in the rehabilitation of injuries to the spine, upper extremity, hip, knee, foot, and ankle complex. 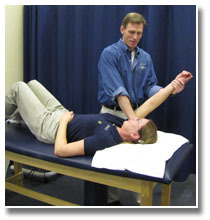 We also specialize in manual therapy techniques, hand therapy, and women's health. We strive to provide a rehabilitation environment where each patient can achieve personal goals in a safe and timely manner. People injured in an accident, athletes, senior citizens, and weekend warriors all benefit from our highly qualified therapy services. To learn more about us, read our Mission Statement, Our Standards, and Why Choose Upper Perk Physical Therapy.